Ice Bellows (remix) began as a study of silence. The initial inquiry set out to capture the sound of ice melting to then amplify such subtlety, but the sound of ice as it melts became fascinating. In the process of amplification, the aural experiment grew quickly away from silence and shifted into a discovery of sound as the ice revealed a musical quality. The sounds came to life in the way Bjork performed a sort of factory musical in the feature Dancer in the Dark – each machine working together to create a composition. 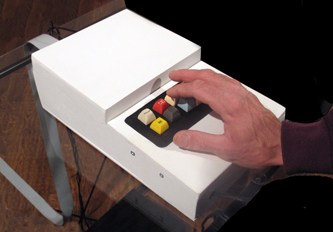 After analyzing and organizing the recorded sounds, a visual interface was erected. 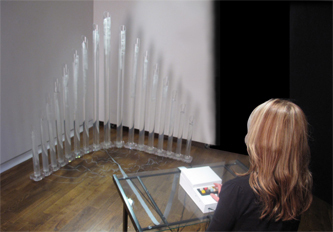 Viewers were then invited to manipulate these sounds through a simulated pipe organ. Thus, the viewer becomes the artist. Concurrently, a musical collaboration of the same sounds was in process with local jazz musician, Dan Schwindt. 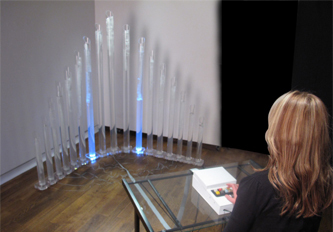 He arranged the captured sounds of ice melting to make a unique composition that serves as a foundational soundscape throughout installation and exhibit.